4.66 out of 5 based on 44 reviews. Who loves beautiful clean, fresh laundry? We all do! Which is why it’s devastating when you go to collect your beautifully laundered clothes from the outside washing line, only to find them smoky, dusty, covered in bird turd or still wet. Introducing the Vileda 27m Infinity Clothes Airer … the perfect solution for fresh, clean and perfectly dry laundry! What is special about Vileda’s Infinity Clothes Airer? The Infinity large laundry dryer has been created for a large amount of laundry … 27 metres worth to be exact! 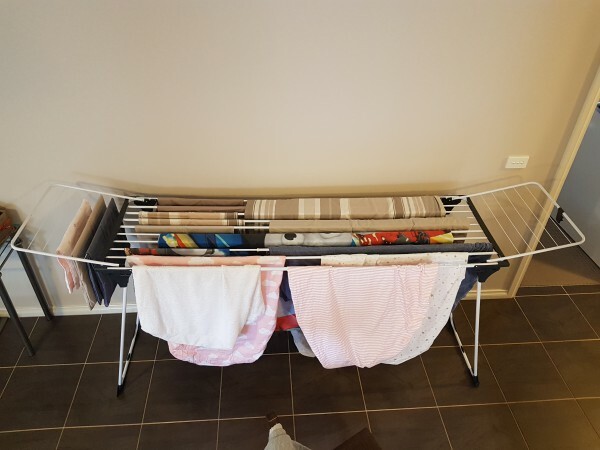 It has a raised frame and retractable cables, so you can hang both everyday washing, as well as larger items such as tablecloths and bed sheets. It has telescopic cables, which are adjustable from 186 cm to 257 cm wide. When fully unfolded, it can hold up to 3 loads of washing. It has an additional hanger for small underwear. Its versatility and mobility has been increased by legs finished with enclosed casters. It also has an additional lock of the wings and protection against accidental folding. 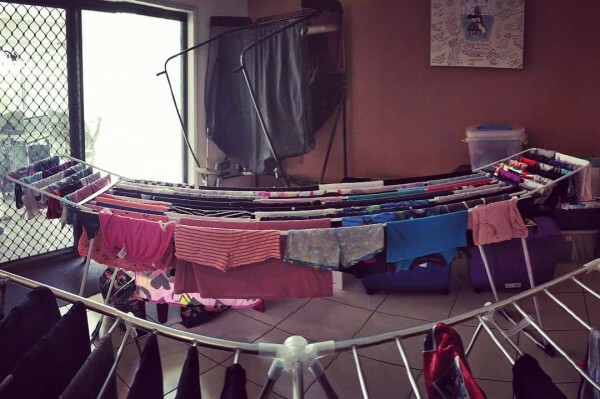 We’ve selected our review team for the Vileda Infinity Clothes Airer Product Review. 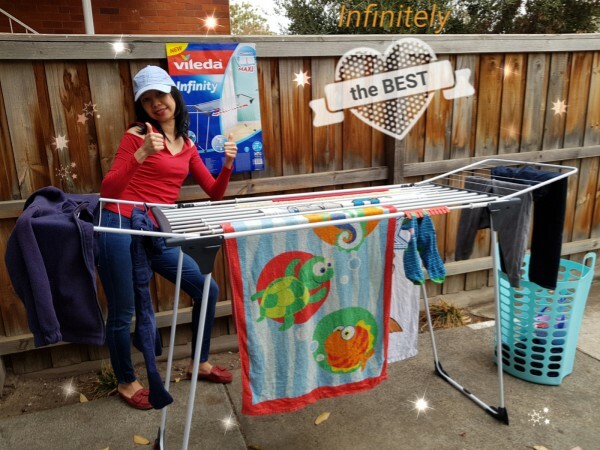 Stay tuned as our MoM.Review team use the Vileda Infinity Clothes Airer at home and share their ratings and reviews – both socially and on this page. Where can you buy the Vileda Infinity Clothes Airer? 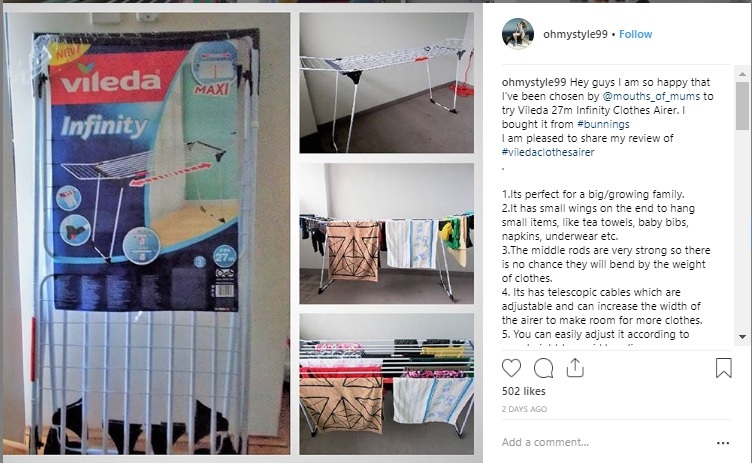 You can purchase the Vileda Infinity Clothes Airer (as well as other products from the Vileda range) from your nearest Bunnings Store. If you’re a member of our review team (or even if you’re not but have one at home), we would especially LOVE to see you post VIDEO REVIEWS. Click on the below button to upload your videos and please remember to HOLD YOUR PHONE SIDEWAYS in landscape orientation, so you take advantage of your full screen space. This is my first time to try using this brand. I’m very amazed with the size of the clothes airier! It can also be use indoors or outdoors. This one is very perfect for this season since it’s almost Winter and it will be real cold outside! I may be able to use this indoor without worrying with how to dry my linens and other big laundry stuffs! It is very easy to set-up and also very convenient specially for a mum like me. Thank you Mouth of Mums and Vileda! I love this product and my family loves it too! Will definitely recommend this to my friends and family! Now that my clothes dryer has pooped itself, I find I need to wash clothes more often so they have enough time to dry. I have 5 boys with my partner and myself. The Vilest clothes airer is great and I would recommend it to people to buy. The first day I used it I did some smaller loads, about 3 and it filled the whole clothes airer when it’s was fully extended. The second day I used it I did a big load of everyone’s clothes it’s filled it up but wasn’t fully extended it was only partially. To set up the Vileda clothes airer was pretty easy once I worked out how to clip it together. I would definitely recommend the Vileda 27m infinity clothes airer. I was using my Kmart one but always got annoyed that it wouldn’t hold all the clothes I needed dryer. So Happy with the Vilest clothes airer it is just what we need. My washing machine died last week and so I did a weeks worth of towels for a family of 5 in one go at the laundromat… while my clothes line and clothes horse would have buckled even sharing the load of about 11 bath sheets and towels, 2 bath mats, 4 hand towels and numerous face washers, I managed to load them all on without an issue. Definitely a keeper! I like the Vileda 27m Infinity Clothes Airer! It is wide it fits linens on it perfectly! I will absolutely recommend this to my friends and family! They will certainly love this too! I am now starting to use mine today. It is absolutely fantastic and safe to use as well. Its perfect. 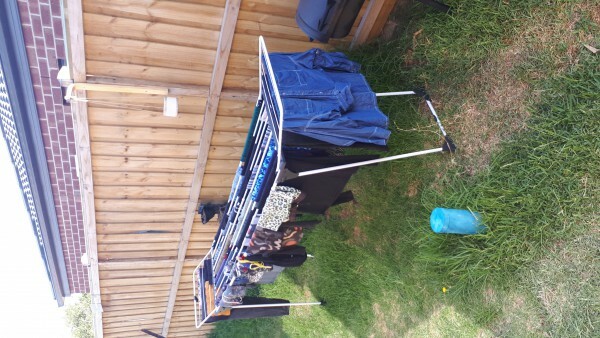 With nearly a week of rain ive been able to stay on top of my washing thanks to the Vileda 27m Infinity Clothes Airer. Im a mum of a very active nearly 3yr old lil man and am also currently going through chemotherapy so the easier the better for me and i found it so easy to assemble and takes up no room at all in the house so you are not tripping over things. One will do instead of a few airers. Coming into winter and again having to find places to dry the clothes inside. It was time to replace some of the airers. Seeing this on MOM thought to give it ago as it should hold the family washing, the main things being the bed linens. Was totally surprise at how much it could hold and no problems with the King bed sheets. Have now replace all the airers we had with two Vileda Infinity Clothes Airers. So this winter there will be no problems with the drying of the whole house clothing. 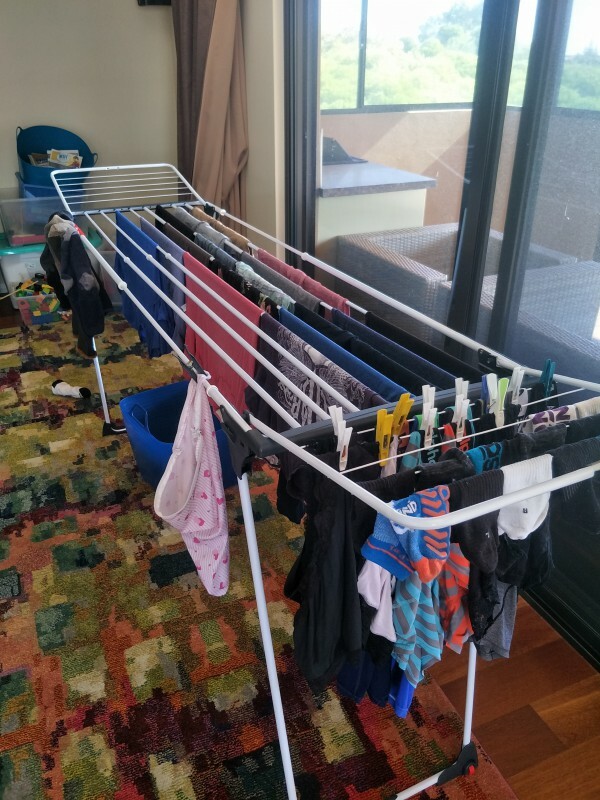 The wet season had just arrived in Perth and this vileda airer saved me from a laundry pile up during the school holidays!! Holds 2 loads!! Doubles great as a cubby as my kids found out when I did the bed sheets! The Vileda Infinity Clothes Airer fits a large load of washing! First thing I noticed was the height off the ground. A bit higher than other airers I have used but love it. The height is perfect for towels. Nothing hangs on the ground. Love how it extends.. perfect for large loads of washing… everything fits. The construction feels sturdy and so easy to extend. I am so excited about this clothes airer. In the past we have bought cheap ones and they always snap and need to be replaced. This clothes airer is sturdy and well made. In the long run it will save us so much money. My husband is 6’8 and usually gets frustrated while hanging clothes on a clothes airer because his back gets sore, this one is such a great height for both of us. 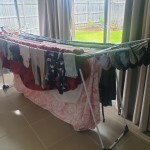 Great product and I am so excited to have a clothes airer that fits more than one load! Upgraded my clothes airer for the Vileda 27m Infinity Clothes Airer. It is much wider, taller and feels sturdier (made of metal). Easy instructions to put together for the first time. Main reasons for trying this was to dry our bed sheets and matress protector especially in winter as we have a small outdoor line which is hard to reach. Upon setup the cables seem quite close together which may minimise airflow, however it it much taller than an average clothes airer. 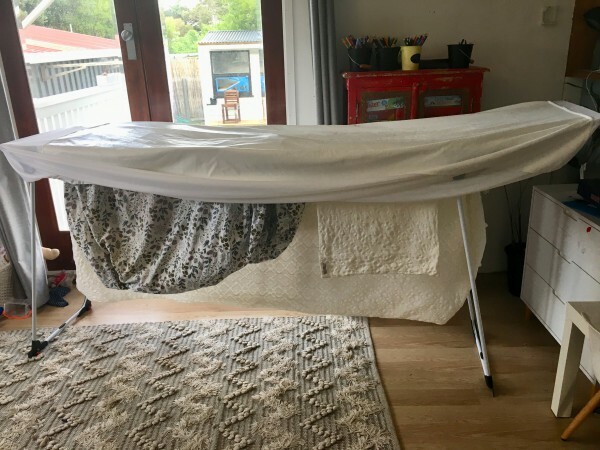 – Advertised as being able to wash sheets etc however you would only be able to do one (Queen size) at a time as it drapes onto the floor (see attached image). So for now I still had to dry my sheets and protector outdoors. This clothes airer is exactly what I’ve been looking for! My house backs onto a golf course and one of the by-laws is that players are not to see any washing from the course. This means that I have to hang my washing on a fold out clothesline inconveniently mounted inside the garage. The Vileda Infinity allows me to hang sheets, tablecloths, towels and clothes easily without having to struggle in the garage! The best part is it can hold up to 3 loads of washing and the wires don’t buckle when holding loads of heavy wet towels! The wires are not only thick – but are crease free!!!! The Vileda has wheels for easy moving, it is compact when folded, it’s really sturdy & made out of solid materials! The lock in corners means there is no accidental folding/collapsing making it safer to use around small children! The only negative about the Vileda is that I wish the red clip was longer and able to hold more than a few pairs of socks! Regardless- I am a huge fan, I’ll be using this from now on, no more awkward garage trips for me, thank you Vileda!!! I loved reviewing this product. The Airer truly goes to infinity and beyond. It told two loads of family washing (4 of us) not to mention bed sheets and towels with ease. It’s strong frame is great for heavy things like doonas and blankets. It’s super easy to fold away and set up. I absolutely loved it, especially with all the rain we’re having at the moment. I currently have 9 clothes airers and normally they would fill my garage. This clothes airer is big enough to take the sheets or blankets on those rainy days. I love the length and height however opening it to its full length is not so easy. Might take some time to get used to. Had to awkwardly stand it upright and pull up to get it to open the first time. I can now wash the sheets and towels on the same day without using the dryer. Other brands are made cheap and not strong enough or simply arent as big or colapsable as this one. If you use clothes airers alot it is definitely worth investing in. Wanted to buy it as soon as i heard about it. Will definitely consider getting a second one to get rid of all of my other clothes airers. Washing is more up-to-date than it’s been in years! 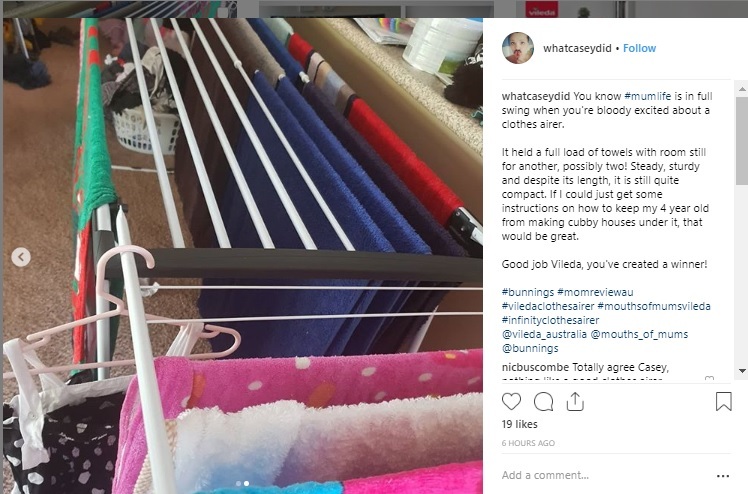 I’ve been using the Vileda Infinity Airer for over a week now & just had to write an updated review because I can’t believe how much it’s helped me get on top of my washing! With so much space I’m not having to hold off on extra loads, I’ve got room to dry everything at once – YAY!!! ???????? I’ve also discovered it’s the perfect place to dry my son’s mattress protector. He’s a bedwetter & his protector usually takes SO long to dry the plastic-y waterproof side & I have to shift it around every few hours cause of the awkward shape, but check out this pic. Ta-da! Dry within the day & ready for the next round of piddle ??????? ?… This airer is the BEST! So glad to welcome Vileda Infinity to my home. Living in an apartment with lack of drying space, Vileda Infinity is the ANSWER. COMPACT, easily FOLDABLE, I can use it indoors or outdoors anytime I need. STEADY framework makes it not fall easily. It has the RIGHT HEIGHT to hang my longer towels so it doesn’t touch the floor. It has CONVENIENT hanger perfect for socks and underwear. Saying WOW to its EXPANDABLE cable -lines for my huge bedsheets and tableclothes. MOBILITY is good with its enclosed casters. LIGHT WEIGHT I can carry it easily by myself anytime and everywhere. Such a CLEVER DESIGN, good QUALITY clothes airer, I can use for many years. Vileda Infinity for my family, is INFINITELY the best! The infinity Airer is amazing. 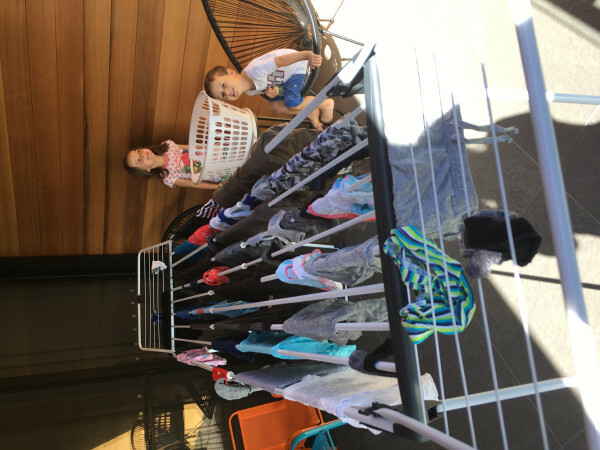 As a family of 4, this Airer managed to hang two loads of family washing. It is well built compared to other inside Airers I have tried. It folds away with ease and assembles easily. After all the rain Townsville suffered, and still having this has been super helpful. I love it and highly recommend it to anyone who drys clothes inside. 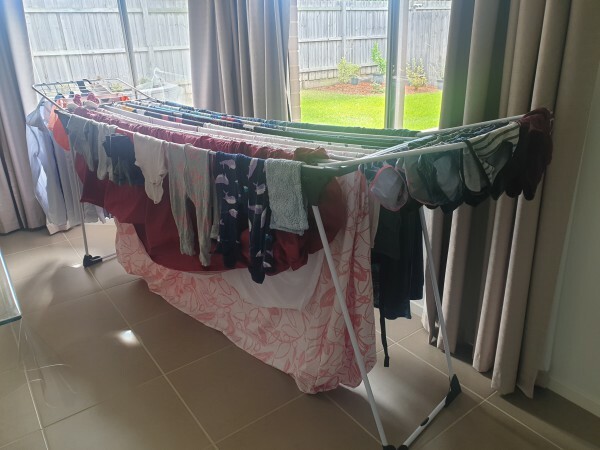 So handy when I can get a big load of washing on its spread out so it dries quickly. The hight is good so towels etc wont touch the floor. An amazing clothes airer. Perfect for families! I’m really happy with this product. Firstly as you can see in my photo it’s more compact than my previous clothes airer, which is amazing considering how much more I can hang on the Vileda airer. It is slightly taller than my old one but takes up less space overall and can fit perfectly behind a door or under a bed when not in use. Its surprisingly sturdy when fully extended and I can’t believe I fit a full load of washing and a full load of towels in one go! One major benefit for me is that the towels fit properly on the Vileda….on my old one they didn’t quite fit and had to be bunched up at the sides. 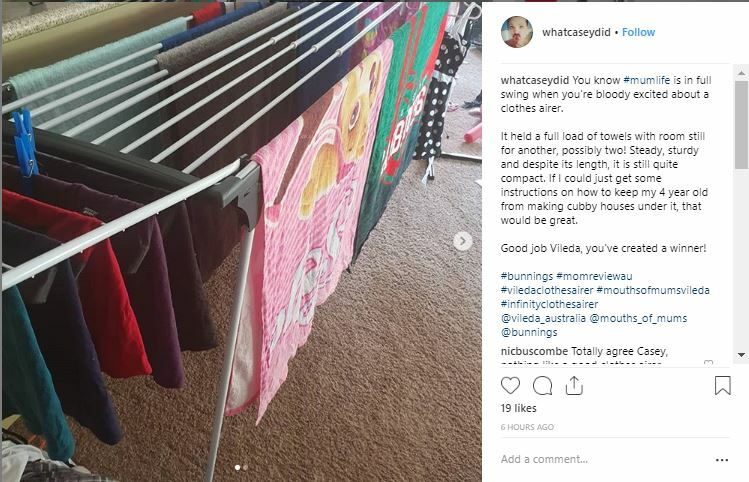 The only negative of the Vileda is there aren’t many spots on the sock airer and they are quite big hooks so kids socks don’t quite fit so I’ll just use a little hanging peg airer to the end and that covers all my drying needs! Perfect for sheets and towels! The Vileda 27m Infinity Clothes Airer is a godsend! I’ve never been one to use the clothesline outside, even for bed linen and towels, so for this Vileda product to come onto the market is just the best! Now I’m able to wash all the bed linen (1 x queen bed with 6 pillow cases, 1 x single bed with 2 pillow cases and 1 x cot) AND towels in the one day and have them all hanging in the one place. At the time of this photo, I was still waiting for towels to finish and they would easily fit on the end. So happy with this product! I was surprised that it holds so much. 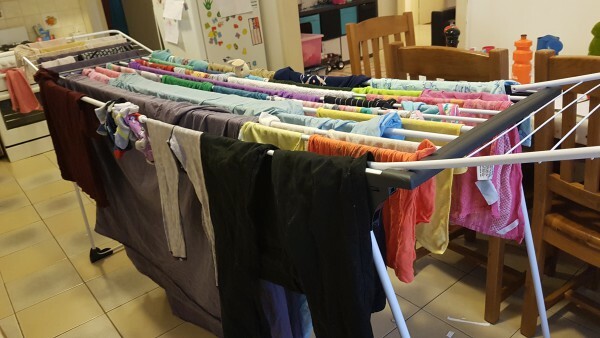 I did 2 loads of washing with 3 sheets. The king single size fitted sheet went perfectly over the rail without touching the ground. The queen sheet set needed 2 rails and i definitely need more practice getting it to fit in a way that will allow it to dry easily. I would recommend less washing if you are doing sheets!